Our family of three has become a family of four! Our newest member; "baby" Jake, joined us at the start of the July and our whole world has once again changed. 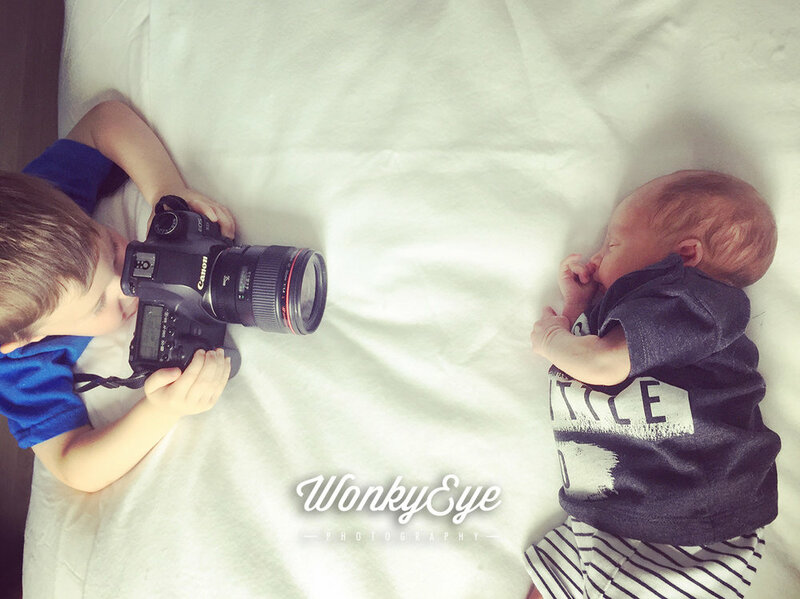 I'm now on maternity leave but that leaves plenty of time to photograph my two boys. Photographing a newborn is always a challenge but throw a two year old into the mix and it suddenly becomes a lot more "fun"! The only way for me to be able to get any photos of Jake without Eli's head, hands or legs appearing was to turn Eli into my assistant, and what two year old doesn't like to be a helper. For this shot I needed more natural light so I got my 'assistant' to hold a reflector, which would bounce the light from the window onto the area I was photographing. Anything white will do the same job. The main thing to remember if you have a toddler and are trying to photograph your little bundle is toddlers get bored quickly. Within five minutes these photos were abandoned. Have your area organised . For this I used the spare bedroom which has lots of natural light in the morning. I had everything ready the night before. This includes, a changing mat, nappies, extra clothes for the baby, toys for the toddler, and props for the photo. Take a photo to see where your dark areas are and then use your assistant to hold something white behind this to help reflect the light. Be warned if your toddler is like mine you will have to make sure you have one hand that can deflect a thrown sheet/reflector or even a jump onto the baby. Get used to taking photographs using one hand! Make sure you take a photo of both of them.